Saint Bruno was born in Cologne in about the year 1030, of an illustrious family. He was endowed with rare natural gifts, which soon shone with outstanding brilliance in Paris, though he was studying among other gifted young men. Ordained at Cologne, his native city, he became a Canon of its cathedral, and then was a Canon at Rheims, where the direction of studies in theology was entrusted to him. He already had a very strong distaste for honors, and a great desire for the life of contemplation. On the death of the excellent Gervais, Archbishop of Rheims, the region fell for a time into evil hands, and Bruno, who had resisted the decay of religion, became the object of a persecution. He stood firm and called for a papal legate; a council was assembled at Autun, of which Bruno was the soul, and the intruder at Rheims was repulsed, to die later in total obscurity. Bruno was not yet forty years old, but all desired that he assume the charge of the see; yet he could not bring himself to accept this honor. He retired from Rheims, and resolved to forsake the world definitively, to live a life of retirement and penance. Others joined him in retreat, desiring the pursuit of perfection, according to the means Christ prescribed. If you will be perfect, go, sell all that you have and give it to the poor, and you shall have treasure in heaven; and come, follow Me. (Matthew 19:21) Saint Bruno aspired to a desert and, inspired by God, looked towards the Alps of the east. With six companions, four priests and two laymen, Saint Bruno applied to Hugh, Bishop of Grenoble, who led them to a wild solitude called the Chartreuse. There they lived in poverty, self-denial, and silence, each apart in his own cell, meeting only for the worship of God, and employing themselves in copying books. 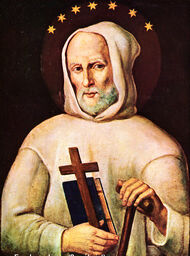 From the name of the solitude the Order of Saint Bruno was called the Carthusian Order. Six years later, Urban II called Bruno to Rome, that he might benefit from his counsel. Bruno tried to live there as he had lived in the desert; but the echoes of the great city disturbed his solitude, and, after refusing high dignities, he finally obtained, by force of persuasion, the permission of the Pope to resume his monastic life, this time in Calabria, with only a few companions. There he lived, in humility and mortification and great peace, until his blessed death occurred, in the arms of his faithful monks, in 1101. Reflection: O everlasting kingdom, said Saint Augustine; kingdom of endless ages, whereon rest untroubled light and the peace of God which surpasses all understanding, where the souls of the Saints are in rest, and everlasting joy crowns their heads, where sorrow and sighing have fled away! When shall I come and appear before God? Always strive after the greater gifts.